My kids are headed back to school this week, and none of us are excited. Summer is our favorite time of year (collectively) and we all moan and groan about the first day of school. It’s not that the kids don’t like school per se, it’s just that going back to school marks the end of our summer glory days; days filled with sunshine, pools, lazy afternoon naps, and trips to the French Riviera. None of that goodness happens during the school year. Except the pool part, my kids swim year round, so at least they can’t complain about that. The fun part about the kids heading back to school, at least for me, is the shopping involved. Surely I can’t be the only parent who loves buying back to school supplies. Please tell me you too love stupid cute back to school supplies. Help a sister out here. I don’t know if it’s all the freshly sharpened pencils or new textbook smell, but I can’t get enough of it, especially since it’s my kids and not me headed into the classroom. Naturally as I am with all things fashion related, I’m excited about putting together cute outfits with the kids. Baby girl never did let me plan her outfits, she realllllly thinks I have no clue when it comes to back to school fashion and that’s not about to change, (apparently I ‘don’t have an eye for style’ AHEM) but my little guy still throws me a bone every once in awhile. It’s good to feel so loved. 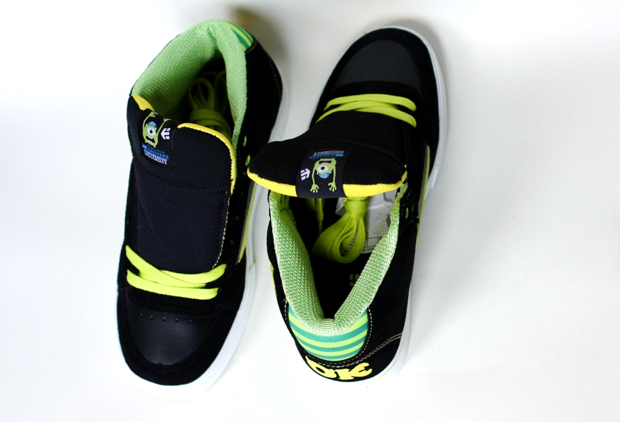 So together, my eight-year-old and I (the only one in my family who’ll indulge me) are super stoked about this pair of Monsters University sneaks Etnies sent our way to check out for the new school year. We went to Disneyland this Summer so we’re all fresh on our Pixar love, and we saw the Monsters University movie when it came out, so we feel pretty good about Mike Wazowski and Sulley right now. Obviously we’re totally team Mike, because hi, Mike Wazowski? We feel like we know you from somewhere Wazowski, and we totally feel your pain that last name is a mouthful. Enough Wazowski already, let’s focus on the shoes for a minute. My only sadness about these shoes is that they don’t make them in my size. 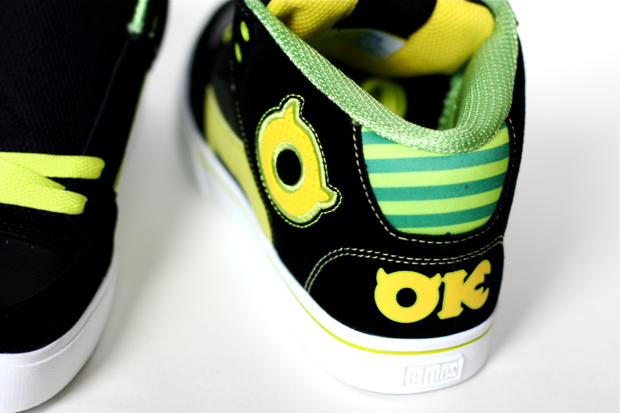 I really want some Etnies sneaks for me too. I mean, I really need some durable shoes for sitting at the computer 12 hours a day. It’s rough territory. Scary terrain. Since I can’t have a pair, I’ll be excited for my kids and their ability to wear kid shoes. 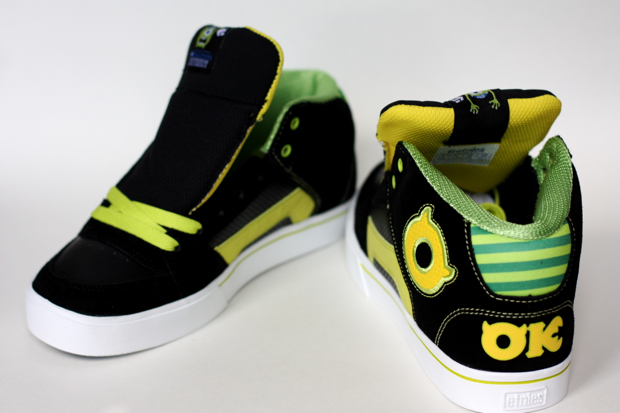 MU kids shoes! Baby boy told me he loves me so much he’s going to wear all green on the first day of school just to match these bad boys. I feel good about that choice. Maybe he’ll blend into the grass at recess and never have to leave the playground. Not likely, but a boy can dream.